Cat Club can hold about 350 - 400 people which means it is small enough to be intimate, yet large enough to accomodate a large crowd comfortably. We are divided into two large rooms: front room (lounge) big bar, espresso bar, big tv & video screen, small stage, two turn table desk, bar seats with table, an old Victorian mirror, and paintings (monthly art show). The back room has a wooden dance floor, small bar, stage, elevated dj booth, an excellent sound system, and is fully equipped for live shows. But come down and check it out for yourself! 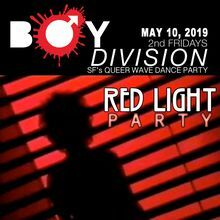 Boy Division / Red Light Party!